During the Cold War many countries were on high alert, none more so than Israel, the US and the Soviet Union. One of the tensest occasions was in October of 1973 when Israel lost over 2000 troops and had more than 7000 wounded by a coordinated attack by Egypt and Syria. The two Middle Eastern countries launched the surprise attack on Israel on the Golan Heights in Syria and along the Suez Canal in Sinai. 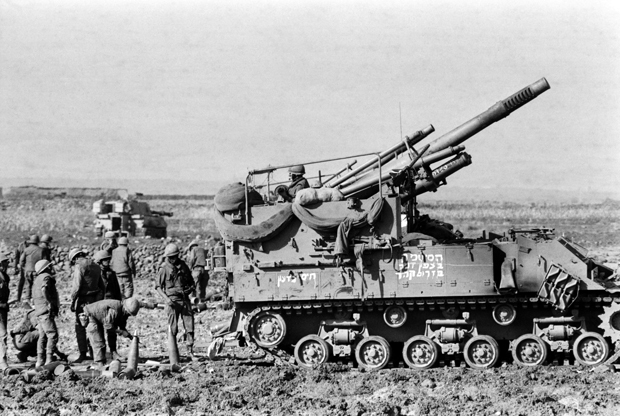 The two-pronged attack ensured Israel had to call up thousands of army reservists to join the fight to defend Israel. The Syrians had acquired WWII era and post war tanks and military equipment from the Soviet Union and was marching across the Golan Heights in T-55 and T-62 Soviet tanks. The Syrians hoped to cut right across into Israel and split the country into two. Meanwhile on the southern front the Egyptians came over the Suez Canal, demolishing sand banks put up in defence by the Israelis. The Israeli troops tried to fight back using American made M-60 tanks and fighter jets but were no match against Egypt’s new anti-tank and anti-aircraft missiles, which were also used to help the Syrians on the northern front. Golda Meir was Israel’s Prime Minister at the time and the entire country began to panic. Military equipment soon started to run low, as death tolls and numbers of injured was rising. The Israeli military was responding in a haphazard way putting anyone, everyone and everything into their response but not in an orderly manner. As a last resort the Israelis decided to engage their nuclear missile launchers and readied their F-4 fighters to lead the charge. They planned to target Egypt and Syria’s military headquarters in both Cairo and Damascus. Records show that three of Israel’s nuclear missiles were ready to be launched. The threat of nuclear war was the perfect deterrent, even though US President Nixon was appalled at the threat the Israeli’s posed to maintaining the balance of power with the Soviets. The US began to provide Israel with military support and supplies and they were able to stave off further attacks from their neighbours, the Market Watch reports. Fuelled by rumours from the CIA, it was thought that the Soviets may have delivered nuclear warheads to Egypt, so the US deployed its nuclear aircraft carrier the John F. Kennedy and B-52 bombers to the region. Thankfully none were used for nuclear purposes. By 1979, Israel agreed to return the area of Sinai that it took control of from the Egyptians during the conflict, but has never returned the land it reclaimed from Syria around the Golan Heights.